Click on map images to enlarge. 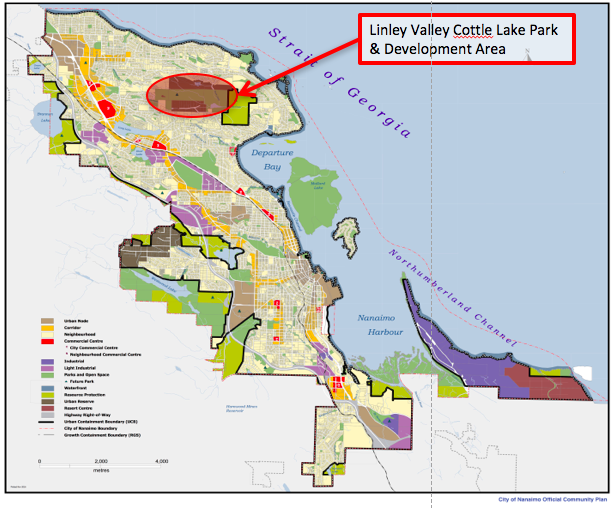 The development area is in the heart of North Nanaimo, along the northern boundary of Linley Valley Cottle Lake Park. This Google Earth view highlights the wilderness features of this incredible ecological jewel, right in the middle of an urban area. Proposed are 469 living units in a mixture of single and multifamily dwellings. On this Nanaimo community plan map, Linley Valley Cottle Lake Park and the Development Area are highlighted in red.